Crime • The couple ran B&W Billiards and Books from home; no arrests made. Trent Nelson | The Salt Lake Tribune South Salt Lake police responded to B & W Billiards and Books, (3466 S. 700 East) Tuesday, November 30, 2010 on a report of a stabbing. Trent Nelson | The Salt Lake Tribune South Salt Lake police responded to B & W Billiards and Books, (3466 S. 700 East) Tuesday, November 30, 2010 on a report of a stabbing. 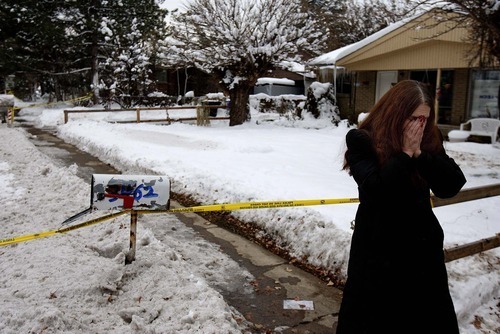 Trent Nelson | The Salt Lake Tribune Mary Wade, who lives near B & W Billiards and Books, reacts to news of a stabbing at the small shop. South Salt Lake police responded to B & W Billiards and Books, (3466 S. 700 East) Tuesday, November 30, 2010 on a report of a stabbing. 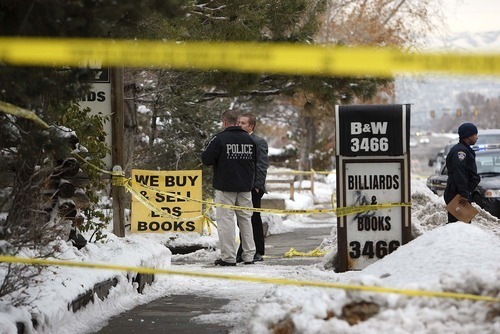 Trent Nelson | The Salt Lake Tribune Mary Wade, who lives near B & W Billiards and Books, reacts to news of a stabbing at the small shop. 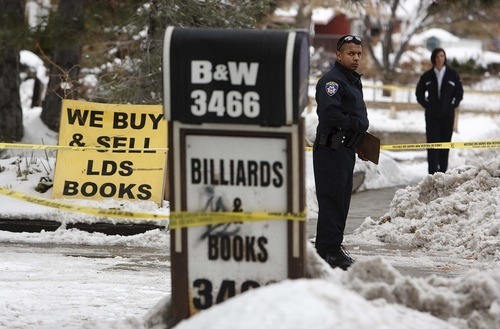 South Salt Lake police responded to B & W Billiards and Books, (3466 S. 700 East) Tuesday on a report of a stabbing. 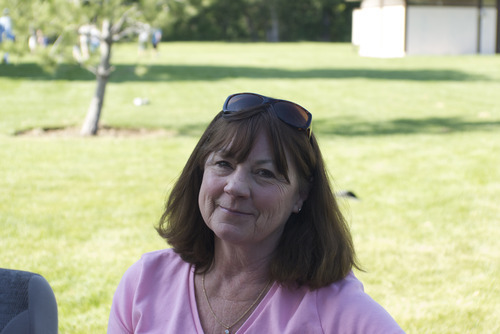 Sherry Black was murdered in her South Salt Lake home on Nov. 30. Police have no suspects or motive in the crime. On Monday, her family released a videotaped interview in which they discuss their memories of their mother and wife, and frustration with the case. 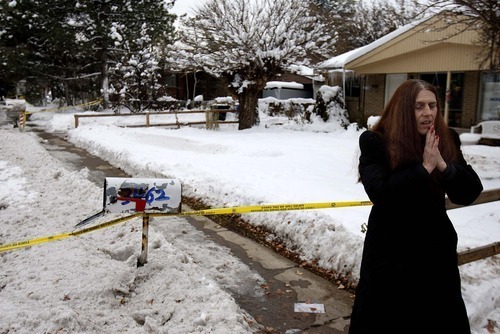 South Salt Lake • Detectives have interviewed the husband of a 64-year-old old woman who was found stabbed to death in the couple's home, but stressed Wednesday he is not considered a suspect. "We have no suspects at this time," said South Salt Lake police Sgt. Gary Keller. "Our detectives continue to follow up several leads but we have not identified any suspects." Police did confirm Wednesday that the victim had been identified as Sherry Black. Black was the mother-in-law of Greg Miller, the CEO of the Larry H. Miller Group, which owns the Utah Jazz. "Today, our family suffered an unimaginable loss," Greg Miller wrote in a statement e-mailed to reporters. "My mother-in-law, Sherry Black, was taken from us in a senseless act of violence. My wife, Heidi, and I ask that you please keep our father, Earl, as well as the entire Black family in your thoughts and prayers during this extremely difficult time." Earl and Sherry Black ran B&W Billiards and Books from a building next to their home at 3466 S. 700 East. Keller said the husband called police at 1:43 p.m. after finding his wife in the home. Keller said there was no doubt that Black was the victim of a homicide. "This was definitely a stabbing," he said, but would not release further details about the slaying. On Tuesday night, the two outside, southbound lanes of 700 East on the 3400 South block were as police cars and folding barriers cordoned the scene. A neighbor, Aixa Burlison, said Earl Black was crying and distraught and officers drove him away in a police car. Earl Black was not in handcuffs, Burlison said. Burlison said Earl Black is friendly with all the neighbors. He talks over the fence, shovels his neighbors' sidewalks and gives them game meat after successful hunting trips, she said. "He's very giving," Burlison said. Another neighbor, Mary Wade, called Earl Black "awesome. The best neighbor you can have." Sherry Black's brother, Jim Waycasy, said he has not been told details of the investigation, but he does not suspect his brother-in-law. "I just assume someone came in, a customer or posing as a customer," Waycasy said. "And there wasn't anybody else there." Waycasy said Sherry Black's used book shop was a successful business. She sold books, mostly Mormon texts and children's books, all over the world, he said. She began the business years ago by going to thrift stores and estate sales looking for books. On her Amazon page Tuesday, Sherry Black was selling a hardcover edition of The Grapes of Wrath for a starting price of $2,750. "She was smart enough to know what books were worth money and which ones weren't," Waycasy said. Salt Lake City book merchant Ken Sanders said he used to see Sherry Black at antique sales. Sherry Black's business was largely "by appointment only," Sanders said. "This is the book trade," Sanders said. "People don't get stabbed to death." Earl Black makes custom knives and pool tables at the business. Greg Miller and his mother, Gail Miller, were at the scene Tuesday talking to investigators. They left about 3:30 p.m. Greg Miller and his wife, Heidi Black Miller, have six children.